Tropical Storm Emily hit with almost no warning. Generally, tropical storms and hurricanes form far enough out that Florida residents have enough time to prepare for the rain and wind. But Emily formed overnight in late July and made landfall in Southwest Florida the next morning. One common threat from tropical storms, hurricanes and other storms that can cause substantial property damage is high winds. 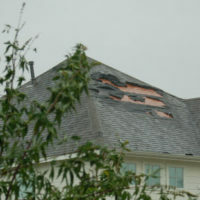 Roof damage. High winds may dislodge shingles, blow debris into your gutters, and knock down trees that can fall onto your roof. Window damage. High winds can tear the siding off of your house and blow it and other debris straight through a window. Falling trees and branches can also break windows. Car damage. If your car is parked outside during a storm then it might be struck by wind-blown debris or falling trees and branches. Water damage. Strong winds can blow rain into your home through broken windows roofs. Floridians are well aware of the damage that hurricanes and tropical storms can cause to their property, but they should also understand how to recover losses from their insurance companies if their claims are denied. Your insurance policy will tell you when to report a loss, but no matter how long your policy gives you, it’s best to report losses immediately. Don’t give the insurance provider a reason to deny your claim. Early reporting might also make it easier to mitigate the damage. One potential problem with wind damage is that it’s not always easy to tell the difference between flooding damage and water damage caused by wind. Your homeowner’s insurance policy probably doesn’t cover flooding, so your provider might claim that wind damage is actually flood damage not covered under your policy. An experienced attorney will help you rebut that contention and help you recover for your property losses. The damage is pre-existing and not covered under the terms of your policy. The policyholder failed to make timely premium payments. The policyholder did not provide sufficient proof of the claimed loss. The policyholder failed to prevent the damage (i.e., there were steps that he or she could have taken to prevent some or all of the damage but did not take those steps). Contact an experienced attorney immediately if your insurance claim is denied, for whatever reason. Contact a Fort Myers insurance attorney at The Pendas Law Firm today for a free consultation if your home has been damaged by high winds. We can guide you through the insurance claims process and help you recover the benefits to which you are entitled. The Pendas Law Firm also represents clients in the Tampa, Orlando, Fort Lauderdale, West Palm Beach, Jacksonville, Miami, Daytona Beach and Bradenton areas.